So far, so good in Michael Andrew’s day-3 triple try. 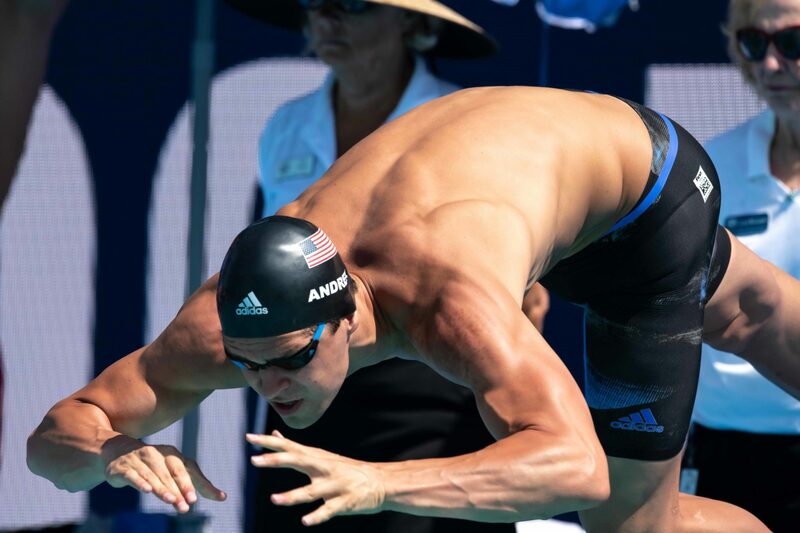 After qualifying 3rd to the final in the 100 fly, he qualified 1st through to finals, and tied the U.S. Open Record, in the men’s 50 breaststroke preliminaries. 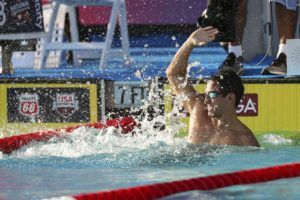 He swam a 26.86 in prelims, which ties him with World Record holder Adam Peaty as the fastest swim ever done on U.S. soil. 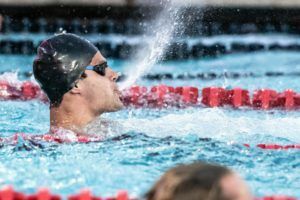 Peaty, a Brit, did his swim in 2017 at the Indianapolis stop of the Pro Swim Series. Andrew is now within a tenth of a second of Kevin Cordes‘ overall American Record of 26.76 that was done at the 2015 World Championships. Cordes, who also swam on Friday in prelims, qualified 3rd in 27.06. Andrew’s previous best time was 27.12, done in Canet at this year’s Mare Nostrum series. 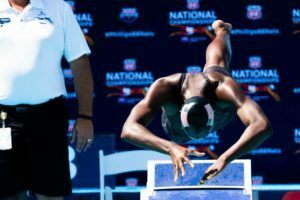 The swim ties retired U.S. Olympian Mark Gangloff as the 2nd-fastest ever done by an American, matching the time that Gangloff did at the super-suited World Championships in 2009. Ian Finnerty, who is the fastest-ever 100 yard and 200 yard breaststroker, also jumped into the top-5 all-time Americans list with his 2nd-ranked swim of 26.96. 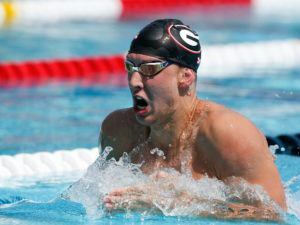 Andrew’s swim also makes him the 12th-fastest all-time, for all nationalities. Dayum, son. Did this in PRELIMS shortly after a 51.9 100FL. 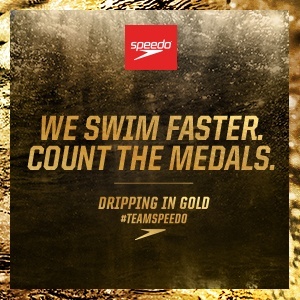 I sense a Phelps/Lochte rivalry with Dressel/Andrew, at least in these shorter distances. Agreed. And at least for now it looks as though Andrew will play the Lochte role (being an all-time great and not being recognized as much as he should). Dressel is on another level but we must appreciate what MA is doing at 19. Unprecedented. I’m simply saying that’s how I think they’ll be looked at. I thought Lochte was much closer to Phelps than the general public did. I think his 1:54.0 is the most impressive swim either of them ever did. 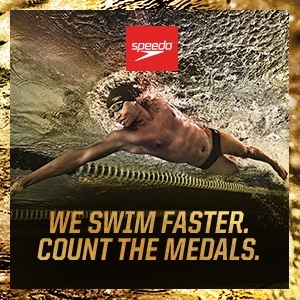 I just think Dressel will win more Olympic medals and that’s how to get attention of casual fans. You can’t argue that at this moment in time Dressel isn’t FAR superior to MA. 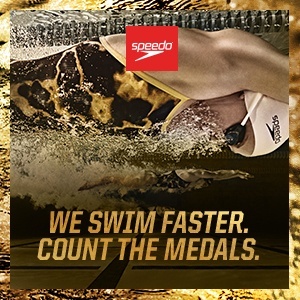 Lochte would’ve for sure won the 2 IM in London if not for the 2 back right before it, that is a #fact. Sure as hell made him tired, tho. It’s not a fact. We’ll never know. I’m simply saying the age gap is different and should be considered, Andrew has accomplished more at his age than Dressel and I expect him to continue to win at the highest level. Andrew is on track to potentially surpass Dressel, people are talking like Dressel was way better than Andrew at his age, which isn’t necessarily true. I think comparing either of them as age group swimmers/just past age group is a false comparison. They were both great in their own way…MA has a ton of NAG accomplishments and Dressel had taken 6 months off before he started college, so yeah, MA has done more by 19. But that’s like saying Chas Morton Is the best NAG swimmer in history until everyone turned 14, it might be true, but no one other than swim nerds even know who Chas is. Chas Morton is swimming’s version of Godwin’s law. What level is Dressel on at this meet? I think Caleb is tapered. Not unprecedented… if you take the GOAT into account. Perhaps unprecedented for 50’s in lcm? Read the comment again. I said for a US Nationals meet. Can we also mention that Dressel was obviously not rested for this meet at all? I mean come on, the kid swims a 17.63 in SCYs.. and 39.9 in the 100 free. Minor correction – Ian Finnerty is the fastest ever in the 100y breast, but Will Licon holds the AR in the 200y breast.